Are Too Many Push-Ups Bad for You? Proper pushups will strengthen your upper body and your core, but too many pushups can provide more harm than benefits. Even if you have gradually increased your number of pushups and do not feel muscle soreness, you are breaking down muscle fibers during the exercise and require recovery. Exercise recovery is an important part of your exercise program and you should always schedule time for it. As you perform pushups, your muscles fatigue. A pushup requires you to move your entire weight throughout the exercise. Even if you have been practicing pushups for years, your muscles will still feel the affects of the resistance. As your muscles tire or increase in soreness, your form can suffer, leading to the use of ligaments and tendons in an excessive way. Performing this exercise incorrectly increases your risk of injury. 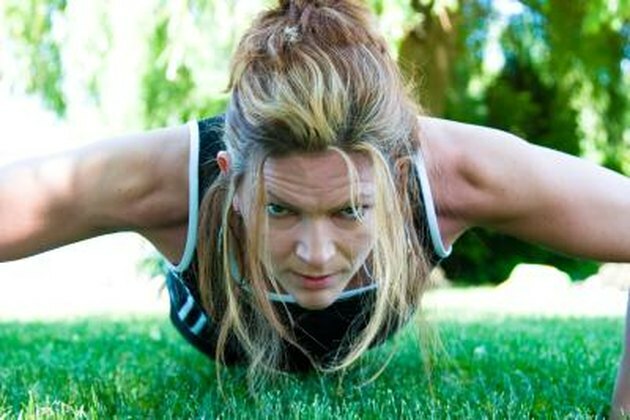 If you perform pushups for muscle strength, too many pushups will not help you reach your goal. Your muscles stop responding to the same exercise over time. If you perform a large amount of pushups, your body will adjust and then will not need to improve muscle fiber strength to perform the movement. For effective muscle strengthening, change the type of exercise every six weeks to challenge your muscles. Your muscles require 48 hours to repair the damage from pushups. If you perform pushups daily, you are not allowing for muscle recovery, which can lead to increased tears in the muscle, or a possible muscle strain. Dr. Len Kravitz, of the University of New Mexico says that exercises that activate multiple muscle groups, such as pushups, require an increased recovery time. If you are a beginner at exercise, aim for two or three days of rest between workouts. If you have been exercising for a prolonged period, one or two days between your pushup sessions should suffice. Overtraining is training intensely without rest. Your body may show signs of overtraining if you perform too many pushups. These signs include an increased resting heart rate, mood fluctuations, muscle soreness, joint soreness, increased tiredness, an inability to sleep or a plateau in strength training. Be aware of these signs and decrease your workouts if you have any overtraining symptoms. Seek your doctor's advice if rest doesn't relieve your symptoms. American Council on Exercise: My Muscles are Sore from a Previous Workout, is it Safe to Exercise Them? Can Push-Ups Strengthen the Rotator Cuff?